The Leipzig University Library provides a new web tool with aims to help Linked Open Data getting established wihtin library-oriented environments. Over the past years more and more institutions started to provide Linked Data with the help of the Resource Description Framework (RDF). The data often is publicly available but since most data sources are only providing conventional web APIs which are not standardized they are difficult to incorporate within existent structures. However, the SPARQL query language provides a standardized and structured way of querying RDF and therefore is one possibility for making this data accessible. The provided tool simplifies the issue of discovering Linked Data resources via ISSN for RDF specialized applications. 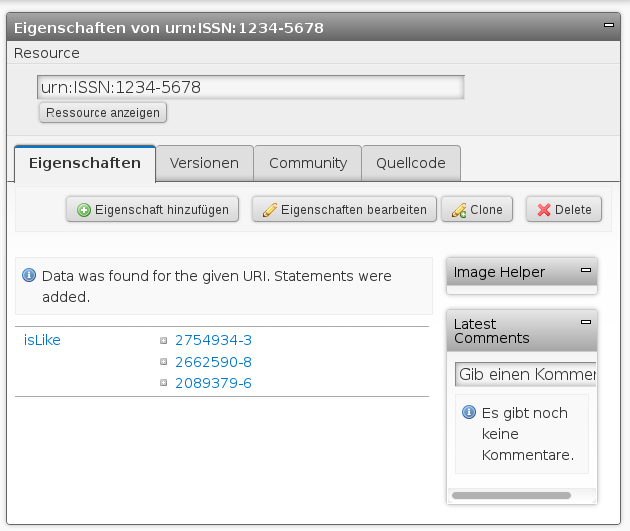 The ISSN-Resolver, developed by the UB Leipzig provides to every queried ISSN the corresponding resources of the Linked Data service of the Zeitschriftendatenbank (ZDB, german database of journals). Every ISSN is transformed into a resource with the help of a “Uniform Resource Name” which is then linked to the corresponding resource of the ZDB using the umbel vocabulary.